Three Marine Corps Women Reservists at Camp Lejeune, North Carolina, 1943. A large group of WAVES (Women Accepted for Volunteer Emergency Service), march in Washington, 1944. These two Women Navy mechanics work on an engine at Naval Air Station Jacksonville, October 27, 1943. Women did serve in some dangerous situations, such as this Nurse who flew with evacuated wounded. This group of US Army Nurses, arrive in Greenock, Scotland, in European Theater of Operations. Ausust 15, 1945. This group of American women of the Women's Army Corps, receive items from the Red Cross, as they wait to board a ship for Europe, July 12, 1945. This is one of the first groups of African American Women to serve overseas (somewhere in England) during WWII, as part of the Women's Army Corps, February 15, 1945. Women of the United States Women's Airforce Service Pilots (WASPs), performed an important roll in the war. They freed up many male pilots to perform combat duting. A group of WASPs (Women Airforce Service Pilots) in front of USAAF B-17 appropreatly named, "Pistol Packin Mama." 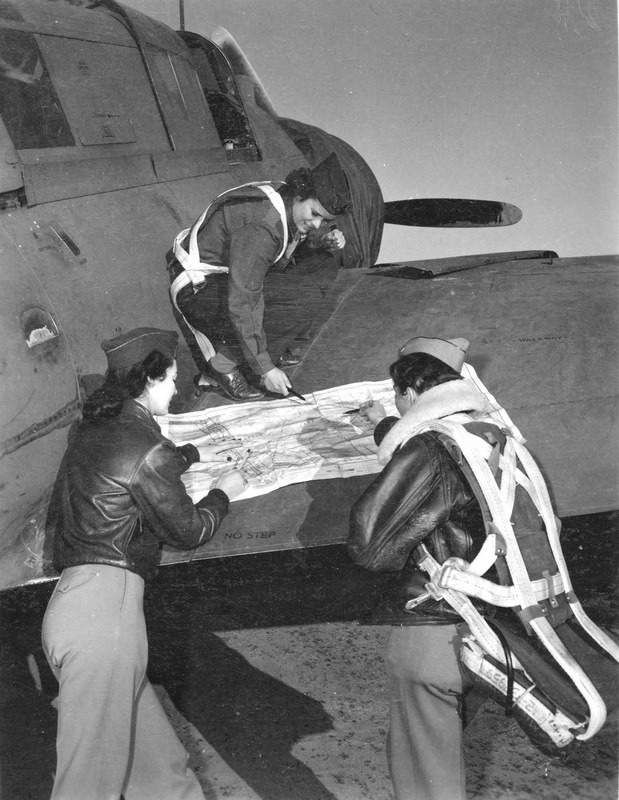 These WASPs check their flight plan on the wing of an A-25. 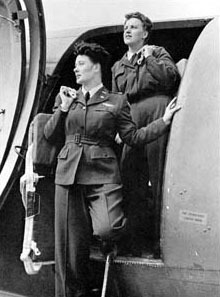 Pilot and Copilot of a C-47 , exit the plane. 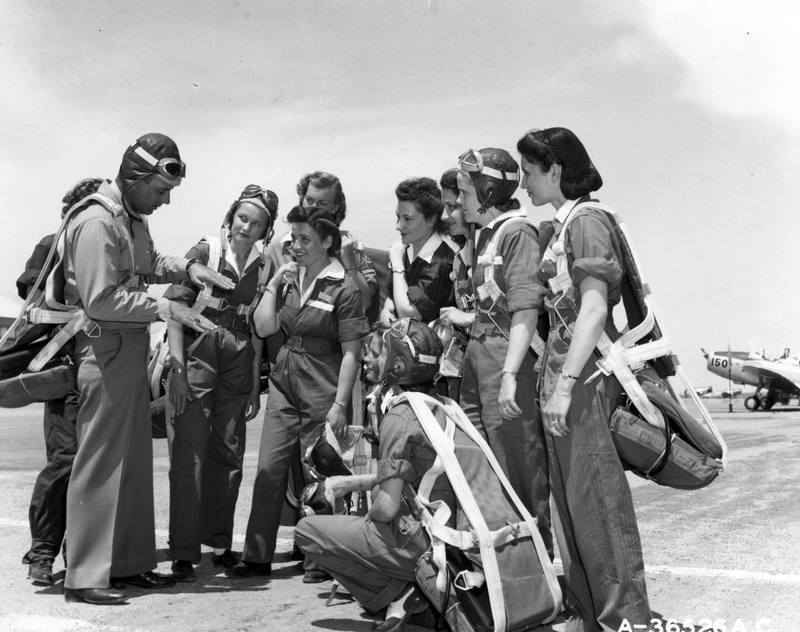 A Group of WASP trainees listen to their instructor. This Brochure was used for Recruitment for the Women's Army Auxiliary Corps,1942. 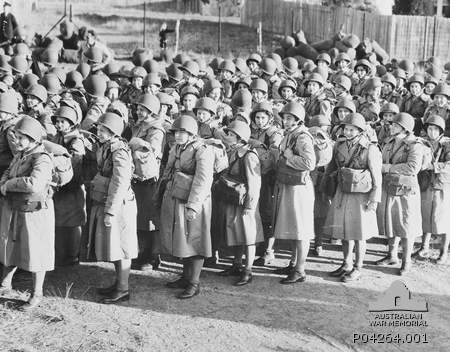 These Women of the Women's Army Auxiliary Corps (WAAC), wait to board a train, in Sydney Australia. This WWII Poster gives women their much deserved credit. 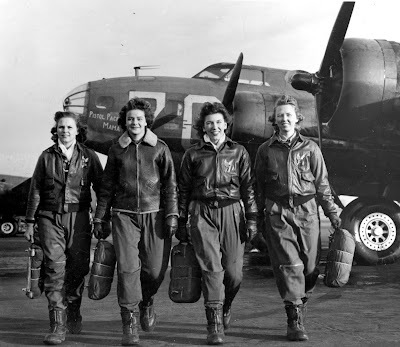 I'm in the middle of collecting photos of Women in WWII, and these are fabulous. I know you've got them locked down pretty tight so people don't steal them, but if you would be so kind as to allow me access to the images in high res (looking for a pilot Aunt of mine) to look them over closely, I promise never to post them on the internet. Wadaya say - any possibility? Thanks for taking a look at them. These images are part of the collection at the National Archives. I've included some information on each photo, if you want to try to contact the National Archives. Good luck in your search. You might also check the Library of Congress. They have some public domain images there too.